MANILA, Philippines - The official results, list of passers, top examinees and other important announcements for March 2018 Civil Service Exam - Pen and Paper Test (CSE-PPT) both for professional and subprofessional levels are released by the Civil Service Commission (CSC) within sixty (60) days after the eligibility examinations. 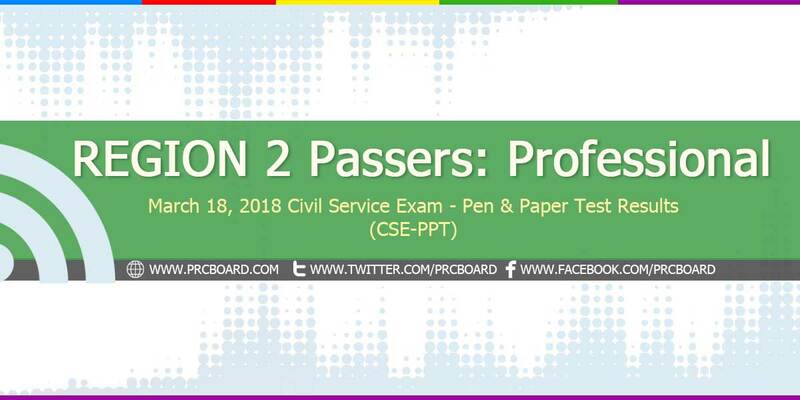 Below is the complete list of passers for March 2018 CSE-PPT Professional Level in Region 2 (Cagayan Valley). Wla pa tlga result ng cs prof.
After 60days pa from the day na nagexam kayo..
Sana lahat tayo naka pasa. Twice nako bumagsak, sana this time makapasa nako. Amen! Sana maka pasa tayong lahat. Amen! Labas niyo na now plsssssssssss! Nakakakaba. Lord Pls pasado na ako. Hindi ako nag exam pero gaya nang nakakarami excited din ako...Yung feeling na inaantay din release ng LET..
Sana pumasa tayong lahat. 😊🙏 #ToGodBeTheGlory! paano po malalaman ang ave score ng exam?